I don’t normally enter giveaways by fellow artists and designers. The main reason is that many of the people holding them aren’t in the UK and don’t offer overseas shipping. 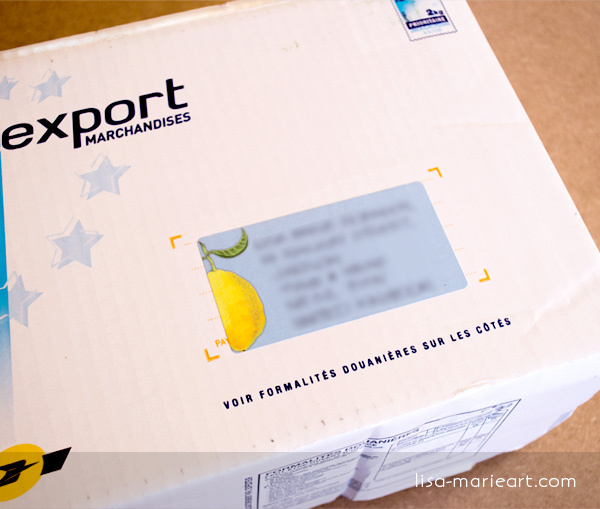 The giveaway held by Mariana of Floating Lemons was open to everyone regardless of location so I entered, and I actually won! I’ve been like a child at Christmas waiting for my parcel to arrive and this morning the wait was finally over! 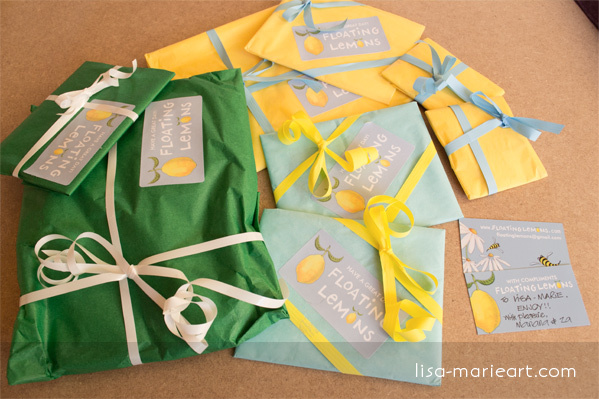 When I finally opened the box everything was wrapped beautifully in tissue paper and tied with ribbons in colours which matched the Floating Lemons logo. 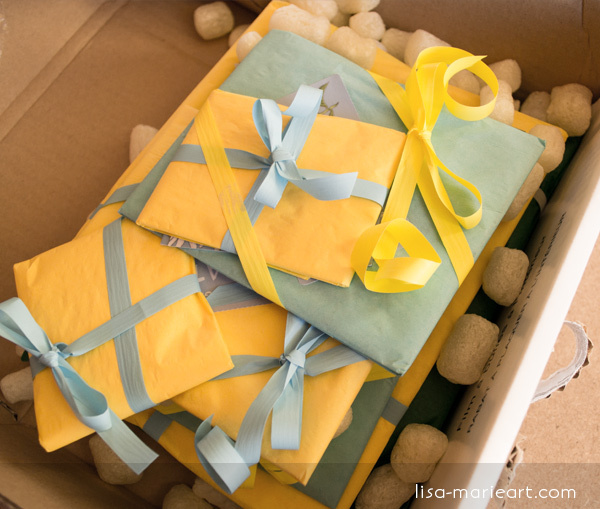 I love the little ‘with compliments’ cards and love the amount of thought that has gone in to the packaging. I’m a little OCD when it comes to wrapping and unwrapping things. I can’t just tear the paper off like a 2 year old at Christmas so I started to carefully unwrap everything. 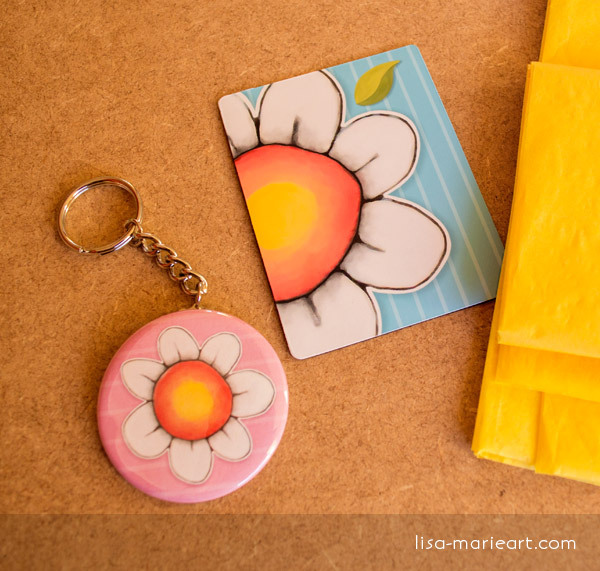 The first things unwrapped were a flexible magnet and keychain from the Floating Lemons Daisy Joy range of products. I also received a matching note card but I was that excited by everything I forgot to add it in the photo. Oops! 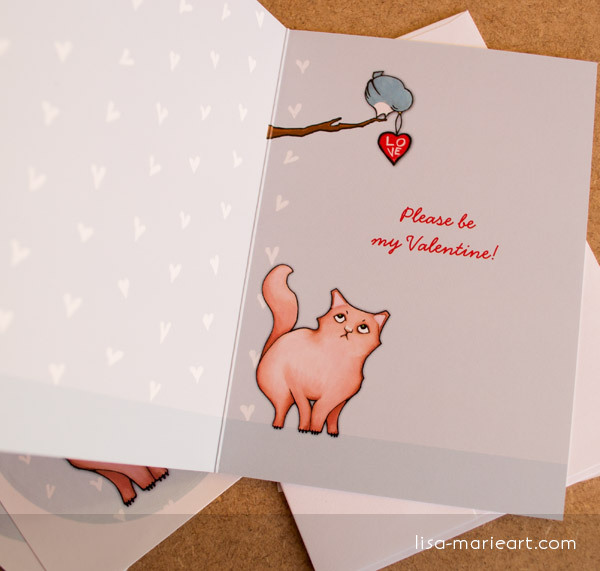 Up next were a greeting card and matching labels from their Rosebud Joy Color range. 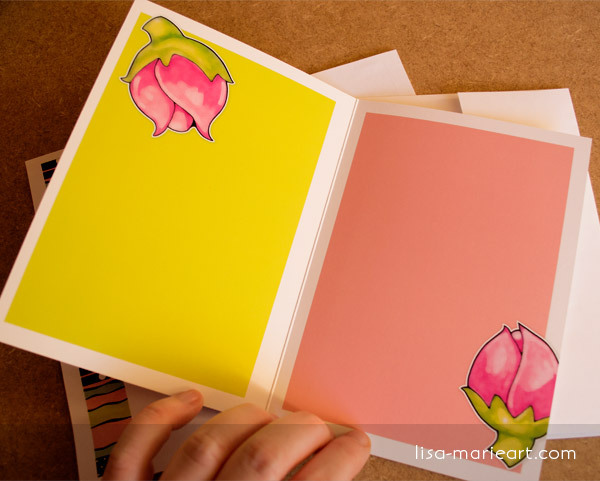 The inside of the greeting card is beautiful and the whole design is so vibrant and colourful. Don’t they just make you smile? There was still even more to unwrap and next were this note card and stickers from the Coffee Cup range. 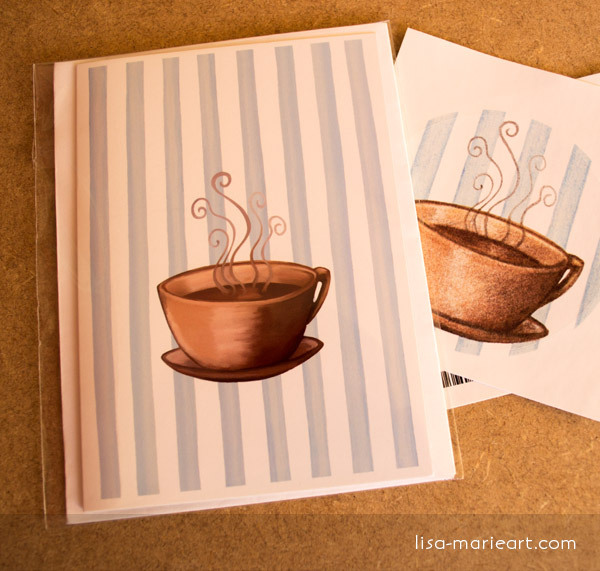 The stickers show the original pencil version of this illustration and the card uses a digital version. I love both! Isn’t Sulky Sue adorable? 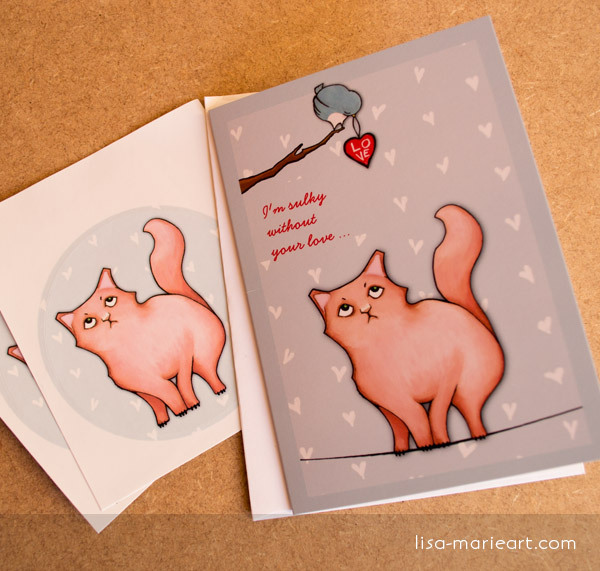 I’m so pleased Mariana added a Sulky Sue Valentine’s card and stickers to the bundle as I love her new Grumpy Cats range. The little bluebird holding the heart is so sweet! 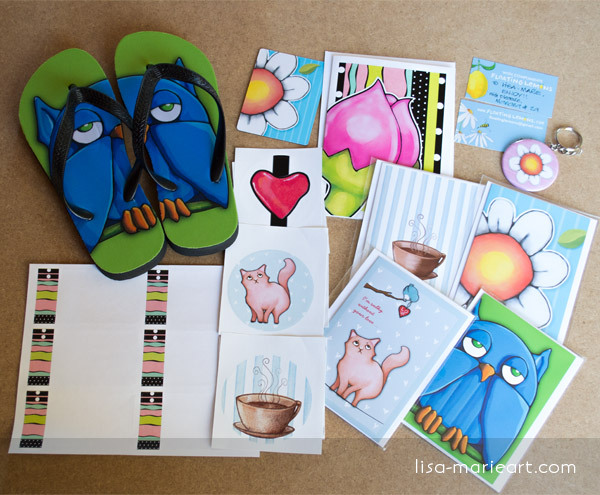 Those flip flops are one of the reasons I entered this competition. Aren’t they fantastic? I was a little sad I had finished unwrapping everything and didn’t want it to end but all good things must come to an end. 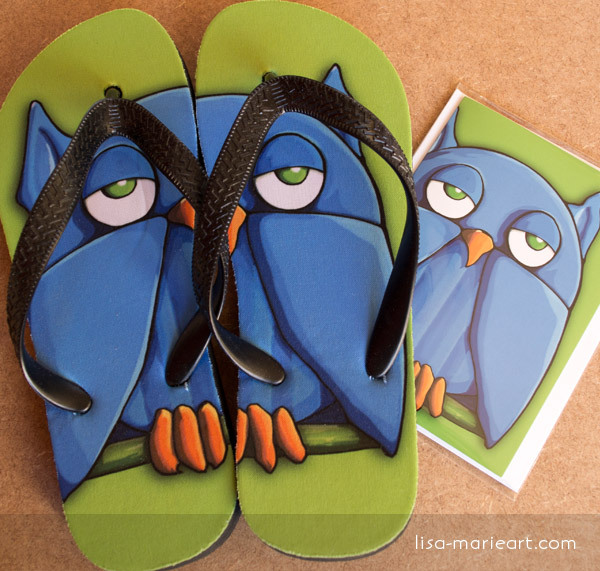 As well as the flip flops (available from CafePress) I also received a matching note card featuring Aqua Owl. Finally, here’s everything laid out together including the daisy joy note card I missed out and some Candy Heart stickers. I apologise for the rubbish photography. I didn’t have time to set my photography light up so I had to make do with natural light. Not so good in a fairly dark house on a snowy day! 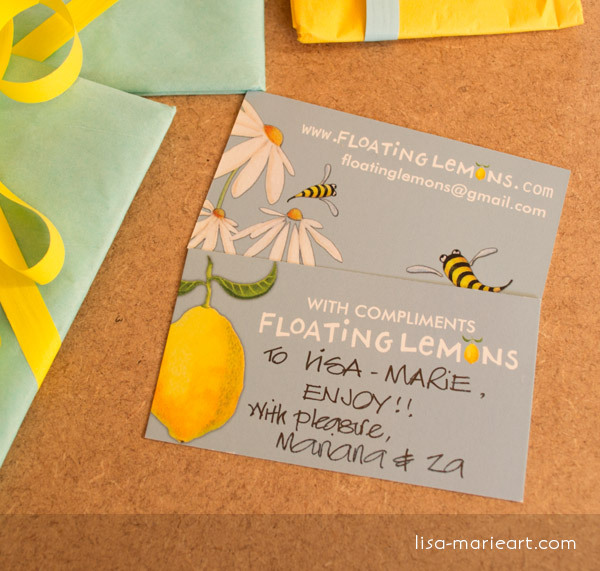 I’ve always admired Mariana of Floating Lemons illustrations and I recommend you check them out. 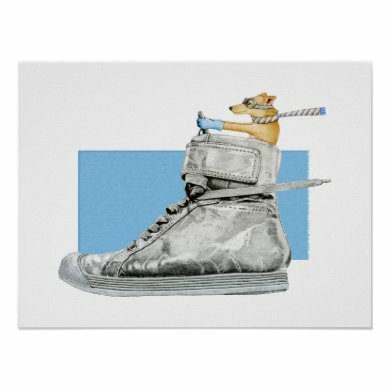 There’s something for everyone… including shoe driving dogs! Wonderful, beautiful things, every one of them!